With black caps and gown, various cords and apricot tassels, new graduates were a bundle of excitement as they waited to cross the stage. As their fellow classmates addressed them, students cheered and hollered and couldn’t wait to be handed their degree. In all, the Sinclair School of Nursing conferred 153 degrees during its commencement ceremony May 13 in Jesse Auditorium. Fifty traditional students received their BSN along with 38 accelerated students, who will finish classes in July. Eighteen students completed the RN to BSN program. 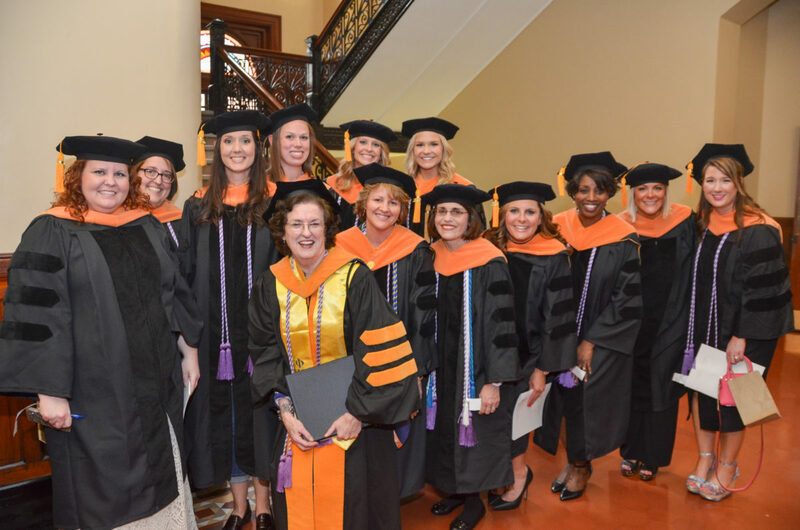 On the graduate level, 10 students received their master’s degree, 36 completed a DNP and one received her PhD. Judith Fitzgerald Miller, Dean, Sinclair School of Nursing, and Garnett Stokes, PhD, provost and executive vice chancellor for academic affairs encouraged and celebrated the graduates. Dominic Chambers, traditional BSN candidate, Christyl Thurman, accelerated BSN candidate, and Sara Landreth, DNP candidate, addressed their fellow classmates. Each graduate also received an apricot rose from Donna Otto, instructor of nursing and director of alumni relations. Earlier in the day, 52 students, most of whom were graduates, were inducted into mid-Missouri’s Alpha Iota chapter of Sigma Theta Tau honor society.